Finding The Sacred Heart Live In Philly 1986 was filmed at The Spectrum in Philadelphia on June 17th, 1986 during the second leg of the Sacred Heart tour, which featured new guitarist Craig Goldy. The show was issued in an edited form first on VHS and then DVD. Now for the first time the full concert is being released in the original running order, restored from the original 16mm film and with remastered sound. It's an extraordinary live show with a giant animatronic dragon towering over the stage and spectacular lasers and pyrotechnics. 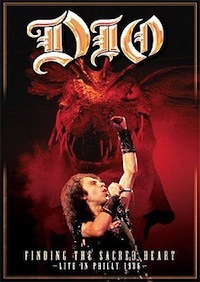 Ronnie James Dio is in fine voice as ever and the band deliver a blistering live performance featuring tracks from their first three albums alongside Black Sabbath and Rainbow classics. This will be a must-have release for any Dio fan!